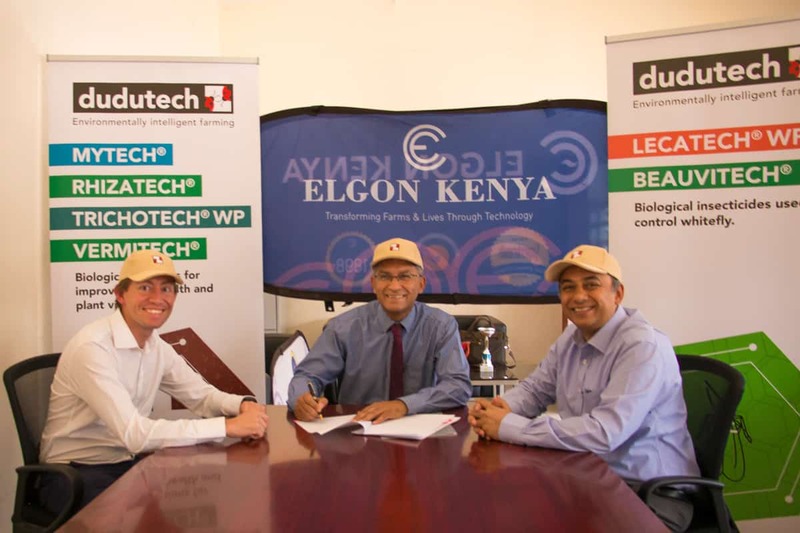 Photo: Tom Mason (MD – Dudutech), Mr Baiju Kantaria (MD – Elgon Kenya Ltd) and Mr Bimal Kantaria (MD – Elgon Kenya Ltd) during the signing of the distribution partnership. On the 11th October 2017, Dudutech partnered with Elgon Kenya as distributors of our bio-control products. Elgon Kenya controls a countrywide network of stockists and agrovets making it easier to get the products to farmers across the country. Their team of agronomists spread across the country’s major food producing zones to assist farmers on the ground. A dedicated sales force with extensive technical and sales experience has been deployed to help customers find the best products to meet their specific needs.